With the recently released Troi Dialog Plug-in 6 for FileMaker Pro you can create very powerful Input Dialogs in a few script steps. Below we show how to display an input dialog with a popup, which displays the values of a second value list, while returning the chosen value from the first list. This (simplified) example uses fixed text to build the dialog, normally you would fill the dialog with data from your database. In ScriptMaker you need to add script steps to a script, but you can of course copy the script from the example files in the download of Troi Dialog Plug-in. First set the values for the popup. For this popup we fill the optional last parameter, which holds a second value list (with item names). Now you can set the defaults. 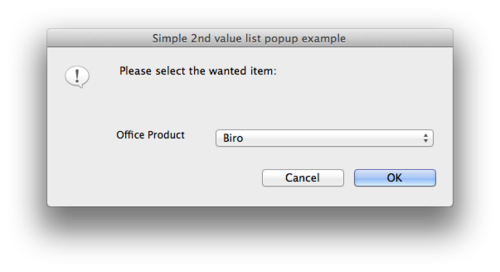 Note that for popup1 the default popup item is selected on the basis of the first item list, in this case “ST0003”. This means that the user selected Pencil, which corresponds with itemID ST0002 and then clicked the OK button.